One of the cool parts of Madrid is called Plaza Mayor-a huge plaza where people meet, resturants and stores exist, and there is a lot of history. Plus various entertainers ply their trade here. 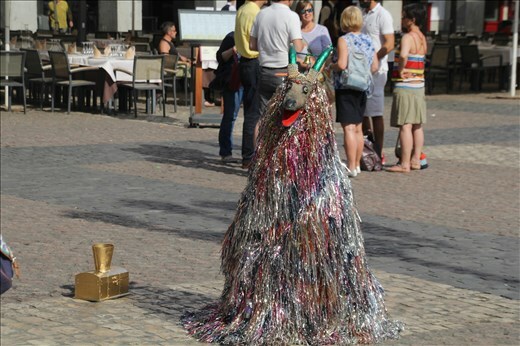 My favorite is some weird, creepy looking dog-with two larges horns, and sides made of silver and gold (actually as I found out it is a man in a dog outfit). The dog sits there, opening and shutting it's mouth and making funny whistling noises to attract attention. When someone throws a coin in the dog's collection basket, the dog starts flapping it's sides. I first met the dog Thurs night, after I got it, and watched him again last night. The only heartbreak with the dog was when the owner took a break-and left his dog outfit out in the open. I wanted to believe it was an actual animal. Just like Santa Claus or Batman-we know it is a man in a costume, but I wanted to believe.